You can always play boring exercises to gain more technique and speed. But what happens when you realize that the goal you are trying to achieve is to be able to play and create songs! Yes, songs are the primary target for any musician, like it or not. This is the final product any guitar player should aim to. This is what we listen on the radio. If you wonder where do you start from with songs, here’s an idea: There is a well-known fact that the best and most famous songs are the easiest ones. True story. The purer the song is, the more remembered it will be. Here you can go through six easy songs you can always start from. Keep that list in your guitar case and use it whenever possible. All time classic – first song on the guitar you could ever learn. 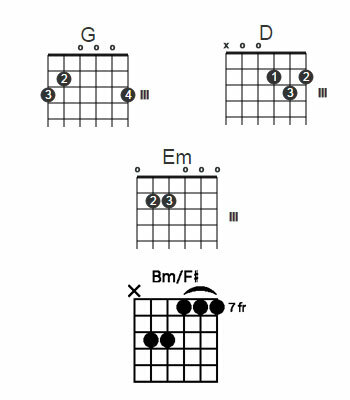 3 Chords: Em, D, C. Then three more chords: G, B, and Em. That’s it. 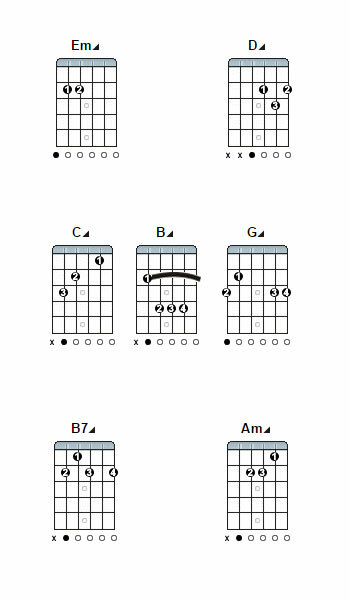 The intro is easy to play with the right hand only: 6,3,2,1,2,3 strings. Metallica has easy songs and difficult songs. But when these are easy, they are beautiful. And this song opens big doors. And minds. Another all-time classic, by Bob Dylan. 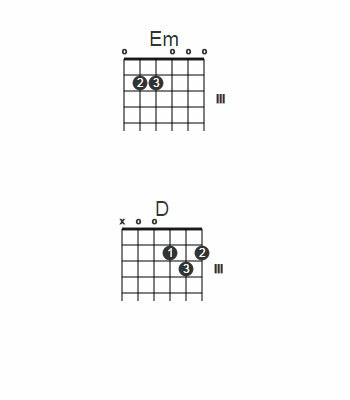 Chords: D, A, Em, then change with D, A, G. Singing is important here. 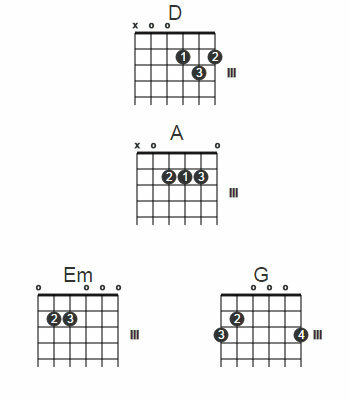 Guns N’ Roses version is a little different: G, D, A, then change with G, D, C.
It is easier to play the GNR version, but still – Bob Dylan is the original author. Try both versions. And don’t forget – the tempo is pretty slow. This is a “riff” song by Seattle megastar band Nirvana. Incredibly simple and amazing riff. 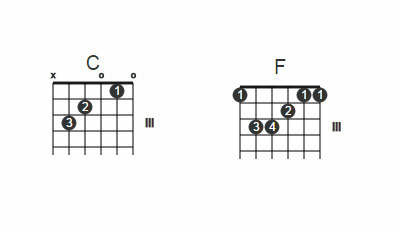 The single note riff is played on 6th and 5th strings, 0,1 and 2nd fret and reverses on the 6th string, and open string, then 2nd fret on the 5th string. It’s important to follow the rhythm correctly here. This song is rocking grunge so that you can add more punch to your playing. Of course! No way without it. 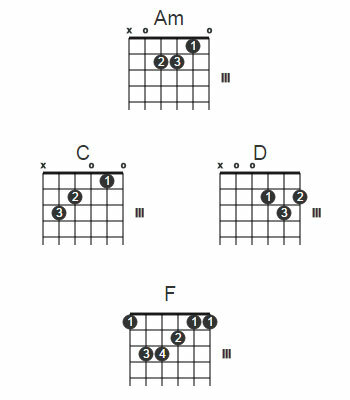 2 string: 3rd and 4th. You can play it with one finger or 2 fingers- it all depends on you. Turn up the volume and wake up these sleepy neighbors. It is not a causality that this song is something like a hymn for guitar players. It is simply a genius riff! A very gentle and beautiful song. Good for sing and soloing like ask and respond. It is not necessarily easy, but once you learn to bend, this solo will make you feel nice. I promise. This ballad wins lady’s hearts. No doubt. Play it slowly and gently. And don’t necessarily go with the solo. The singing over chords is pretty enough. Solo might be more difficult sometimes. Learn it when you have an electric guitar only. Oh yes, The Beatles. You cannot miss them if you are a serious musician. All the work is done by the voices, so my advise is to learn the lyrics and sing. Well, try. 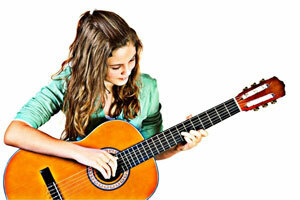 All these six songs are carefully selected to reflect a fundamental guitar knowledge. Of course, there are many complicated parts in these songs, but the way they are presented is more straightforward than initially recorded. If you experience difficulties learning and performing them, don’t worry, the time will give you opportunities to master all the elements. Also, you could always experiment to add your flavor to the songs. This is the way the great cover versions are born – add something from you, keep only the basis and lyrics. Whether if you start to play or you are a pretty advanced player, it is always a good idea to learn from real songs. These are the whole stories that tell emotions with music and words. YOu can always upgrade your performance quality, your details, and your dynamics. The songs are an inseparable part of great parties with friends. Everybody knows how to sing them, so the people will expect you to play them. Besides that, you are learning to perform in front of an audience, which is a stable academy, trust me. There is nothing more precious than training to entertain people. This is where the big things happen.